For the new Academia Skeleton model, DeWitt introduced a brand new movement with the typical traits and aesthetics of the brand. The open-worked dial is characterised by a satin-finished bridge with indented angles and a "black gold" colour tone which creates a nice contrast with the rose gold (ref. AC.SKE.001) or silver (ref. AC.SKE.002) seconds and power reserve indications. The hours and minutes open-worked hands in the shape of double-edged swords are crafted from 18-carat rose gold, just like the hour markers. Positioned at 1 o’clock, the power reserve system is based on the satellite principle already created for the Tourbillon Differentiel model, winner of the innovation award at the Grand Prix de l’Horlogerie de Genève in 2005. The power reserve - expanded to more than 100 hours thanks to the use of a double barrel - is indicated by an arrow located on this differential, which is in constant rotation. A pretty unique feature, the seconds hand at 7 o’clock moves like a windscreen wiper, forwards and backwards. Thanks to a disconnecting gear system, the hand changes direction after 30 seconds and performs an instantaneous jump that sends it in the opposite direction to mark the following 30 seconds. 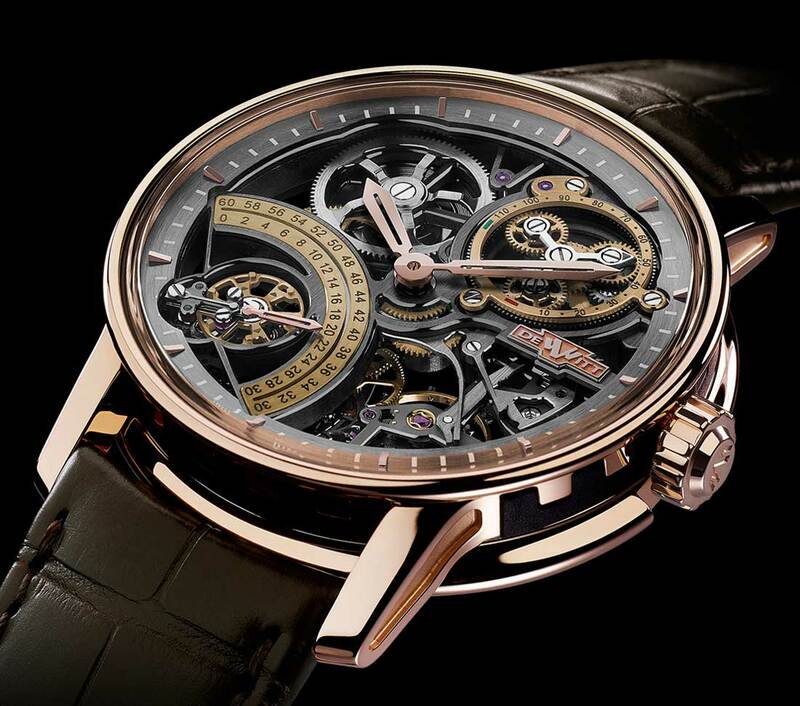 The manufacture hand-wound movement beats at 21,600 vibrations per hours and comprises 263 parts. It is housed in a 42.5 mm x 10.3 mm rose gold case with rubber inserts used to recreate the imperial columns that have become a signature feature of the watchmaker. On the case back, the sapphire crystal reveals the wheels sculptured in relief and the high quality finishing of the movement with satin-brushed surfaces, circular graining, and polished chamfering. 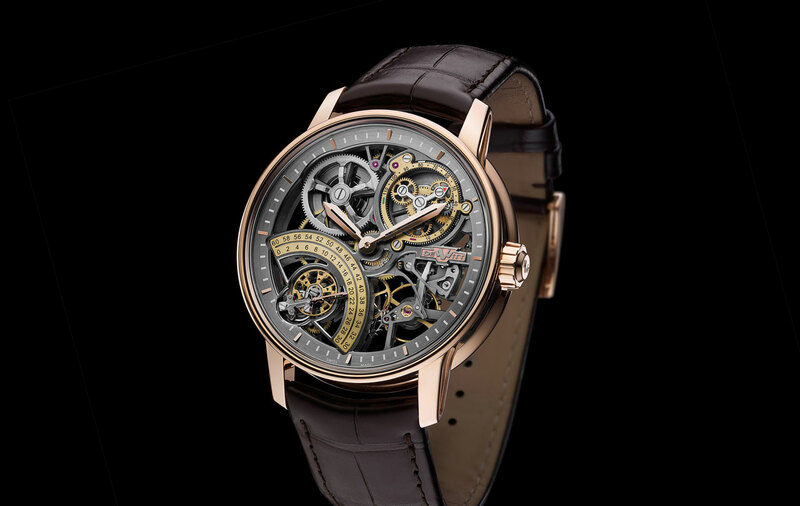 DeWitt Academia Skeleton. 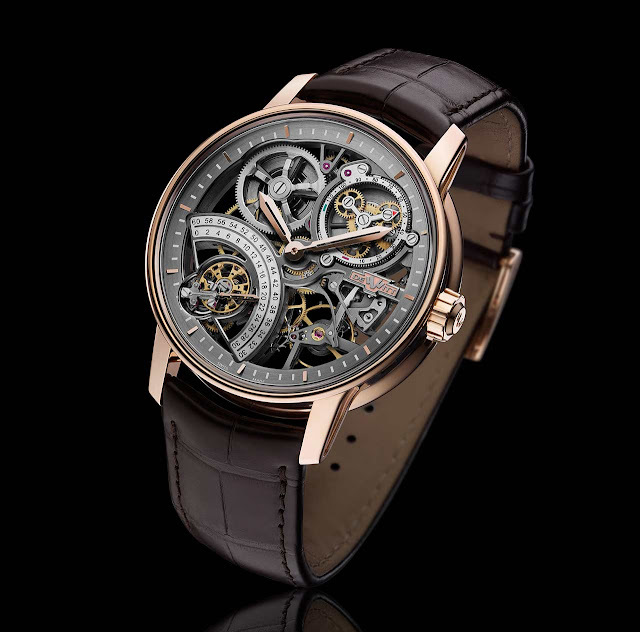 For the new Academia Skeleton model, DeWitt introduced a brand new movement with the typical traits and aesthetics of the brand. The open-worked dial is characterised by a satin-finished bridge with indented angles and a “black gold” colour tone in contrast with the rose gold (ref. AC.SKE.001) or silver (ref. AC.SKE.002) seconds and power reserve indications. 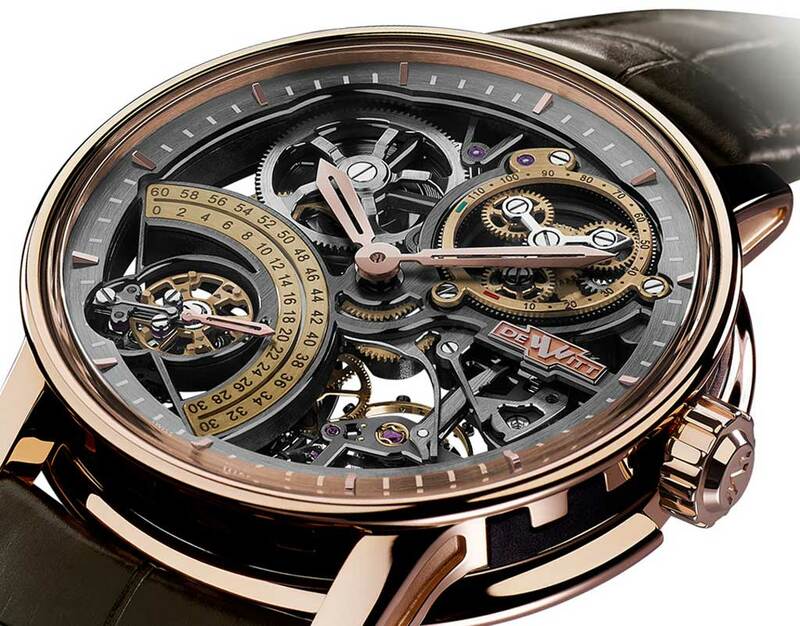 The price of the DeWitt Academia Skeleton is Euro 72,900 / US$ 85,800.